The full sample code used for this post is available as a Ruby on Rails 3.1 project at https://github.com/rietta/SimpleBlogFeed. Suppose you have built an amazing new website using Ruby on Rails 3. It has tons of features and some great content. However, one thing it is lacking is a solid blog section. You would like to avoid writing your own blog code in Rails since there are already tons of solid blog applications to choose from – Wordpress, Moveable Type, Typepad, Blogger.com, and more. # It is important to require the RSS module. If you leave this off, the blog feed will not load. # Do nothing, just continue. The view will skip the blog section if the feed is nil. The latest <%= pluralize(@latest_blog_posts.count, “post”) %> from the blog. 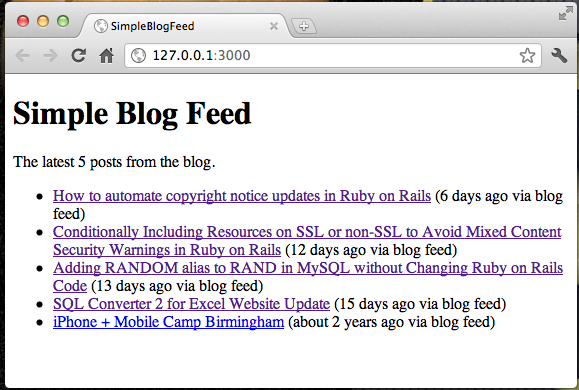 Blogger supports full site, comments-only, and label-specific feeds in Atom and RSS format as per Blogger Feed URLs. The label appears after the –/. It is case sensitive such that “Marketing” is not the same as “marketing”. Unfortunately, this does not work. Attempting to access that feed like that results in an “Unsupported alt type” error from Blogger’s web server. The example code includes a full example of loading feeds from a couple of different labels.